Rainy weather provides more challenges for motorbike riders than car drivers. It changes the friction and feel of the road surface, and reduces visibility, so it’s important that you adjust your riding style and your awareness of potential hazards. Spray: If there’s a lot of standing water on the road surface, it can be thrown up as spray, particularly by heavy vehicles. This will obscure your view of the road ahead and impedes your sight from your visor. If you are following a vehicle kicking up a lot of spray, increase your following distance. If you’re approaching a vehicle that’s likely to kick up spray (such as a large lorry), slow down before you get to it, and watch to see if there are any deep puddles that it will get to at the same time as you. Adjust your speed to minimise this. Fogging: If your visor fogs up, this can dangerously reduce your vision, so make sure you use some kind of anti-fogging product. Lack of light: rain can bring overcast, dull conditions with much less light than on a sunny day. This can make it more difficult to see some kinds of vehicles, and it will definitely make it more difficult for other drivers to see you on your bike. Make sure you’re wearing bright-coloured clothing and that you have your headlight on at all times. Blinding reflections: reflections of the sun off certain types of wet road surface can be blinding. If you are not wearing the right protective waterproof clothing, you will be uncomfortable in wet weather and this provides a distraction while you are riding. If you become really uncomfortable while riding, e.g. by being soaked, it might push you to ride faster than is safe for the conditions just so you finish the journey earlier. If you get cold, your extremities can become numb which reduces your ability to control your bike. In bad cases, you can start to get hypothermia which increases your reaction times. Your footwear is important in wet weather as it helps your feet stay on the foot pegs, which can become slippery. Watch also for a slippery brake pedal. Keeping your palms dry will help you stay in better control as you can grip the handlebars more effectively. When it first starts raining after a dry spell, the accumulation of grime, dust, oil and rubber on the road mixes with the water to form a slick surface that is extremely slippery. If it continues raining, this is washed away and the road remains more slippery than it would be if it was dry. Metal service covers (e.g. manholes) are very slippery so avoid leaning to turn when you are on them. Painted lines can also be more slippery. Your tyres will need enough tread to disperse any standing water otherwise you risk aquaplaning/hydroplaning, which is where your tyre rides up on the surface of the water, effectively reducing your grip to zero. Watch out for patches of water where you can see an oily residue as this could be diesel spilled on the road which will make it very slippery. Motorbikes already take a longer distance to stop than cars. In the wet, this is increase. Lengthen your following distance to 4 seconds. If you are being tailgated, increase it more. 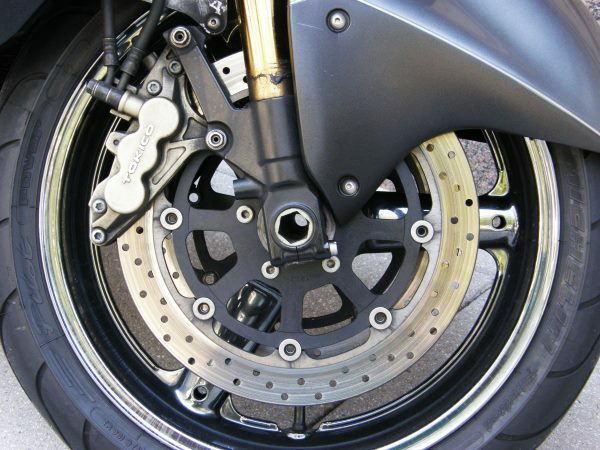 Check out our complete guide to motorbike braking. Because of the increased risks of slippery patches, reduced visibility and more distractions, your scanning (observation of the road) is critical. You’ll need to be looking further ahead for obstacles in the road, and also be aware that other vehicles might not be able to see you. Read our article on motorbike lane positioning so that you can put yourself in the safest place to be seen by other road users. It can be difficult to see deep water, especially at night, so take care in areas that are prone to flash flooding if there is a torrential downpour. If you do find yourself in deep water, keep your engine speed high – you can do this by riding in a lower gear and slightly slipping the clutch – so that water doesn’t enter the exhaust. Once you’re out of the water, test your brakes a few times to dry them off.